Leberzentrum Würzburg » Adaptation of iron transport and metabolism to acute high-altitude hypoxia in mountaineers. Goetze O, Schmitt J, Spliethoff K, Theurl I, Weiss G, Swinkels DW, Tjalsma H, Maggiorini M, Krayenbühl P, Rau M, Fruehauf H, Wojtal KA, Müllhaupt B, Fried M, Gassmann M, Lutz T, Geier A. Human iron homeostasis is regulated by intestinal iron transport, hepatic hepcidin release, and signals from pathways that consume or supply iron. The aim of this study was to characterize the adaptation of iron homeostasis under hypoxia in mountaineers at the levels of (1) hepatic hepcidin release, (2) intestinal iron transport, and (3) systemic inflammatory and erythropoietic responses. Twenty-five healthy mountaineers were studied. Blood samples and duodenal biopsies were taken at baseline of 446 m as well as on day 2 (MG2) and 4 (MG4) after rapid ascent to 4559 m. Divalent metal-ion transporter 1 (DMT-1), ferroportin 1 (FP-1) messenger RNA (mRNA), and protein expression were analyzed in biopsy specimens by quantitative reverse-transcription polymerase chain reaction (RT-PCR) and immunohistochemistry. Serum hepcidin levels were analyzed by mass spectrometry. Serum iron, ferritin, transferrin, interleukin (IL)-6, and C-reactive protein (CRP) were quantified by standard techniques. Serum erythropoietin and growth differentiation factor 15 (GDF15) levels were measured by enzyme-linked immunosorbent assay (ELISA). Under hypoxia, erythropoietin peaked at MG2 (P < 0.001) paralleled by increased GDF15 on MG2 (P < 0.001). Serum iron and ferritin levels declined rapidly on MG2 and MG4 (P < 0.001). Duodenal DMT-1 and FP-1 mRNA expression increased up to 10-fold from baseline on MG2 and MG4 (P < 0.001). Plasma CRP increased on MG2 and MG4, while IL-6 only increased on MG2 (P < 0.001). 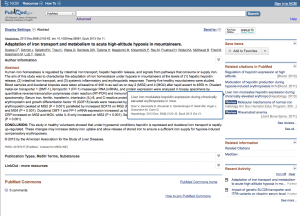 Serum hepcidin levels decreased at high altitude on MG2 and MG4 (P < 0.001).